In October, Prometheus Books published Sharia versus Freedom by Andrew G. Bostom (Brown University Medical School). The publisher’s description follows. 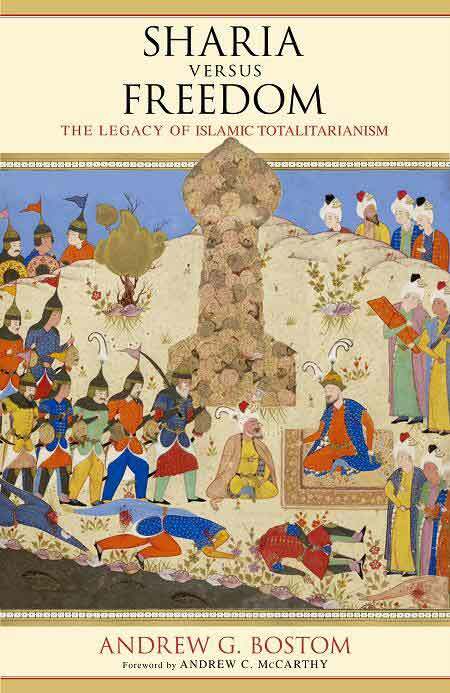 Author Andrew G. Bostom expands upon his two previous groundbreaking compendia, The Legacy of Jihad and The Legacy of Islamic Antisemitism, with this collection of his own recent essays on Sharia—Islamic law. The book elucidates, unapologetically, Sharia’s defining Islamic religious principles and the consequences of its application across space and time, focusing upon contemporary illustrations. A wealth of unambiguous evidence is marshaled, distilled, and analyzed, including: objective, erudite studies of Sharia by leading scholars of Islam; the acknowledgment of Sharia’s global “resurgence,” even by contemporary academic apologists for Islam; an abundance of recent polling data from Muslim nations and Muslim immigrant communities in the West confirming the ongoing, widespread adherence to Sharia’s tenets; the plaintive warnings and admonitions of contemporary Muslim intellectuals—freethinkers and believers, alike—about the incompatibility of Sharia with modern, Western-derived conceptions of universal human rights; and the overt promulgation by authoritative, mainstream international and North American Islamic religious and political organizations of traditional, Sharia-based Muslim legal systems as an integrated whole (i.e., extending well beyond mere “family-law aspects” of Sharia).